We’ve talked about converting a single JPG to PDF on Windows and also converting a JPG to PDF on MacOs both without additional software, only using applications already available with the operating system. If you have multiple JPG images (or other formats like PNG, GIF, BPM, TIFF, WEBP etc.) and want to convert them to PDF then the quickest way is to use an online service. Again, no additional software to install. Just use your browser. Adobe has a suite of online tools called Adobe Document Cloud that can scan documents or convert JPEG images to PDF. 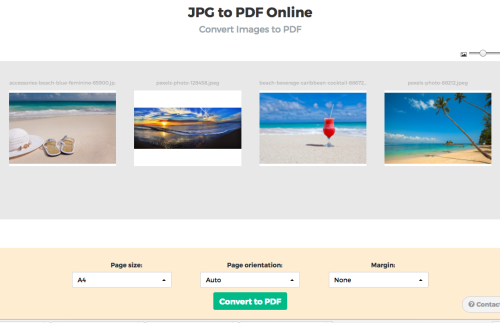 Open up the JPG to PDF online service in your browser. Then select all image files in Finder or Windows Explorer and drag them to the web page. Upload should start and finish quickly, depending on how many images you selected and how large they are. Most of the times the default settings are just fine. If you want a specific page size or want a white margin around your image, you can configure these options now. If your images need to be reordered you can drag them in the right place with the mouse, holding on to the page thumbnail and dragging it left or right. Click the Convert to PDF button and then click Download to save your PDF result. That was it! Easy as sunday morning.